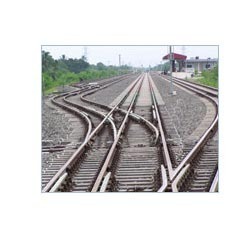 We manufacture Railway Track Material such as Switches, as per the specific requirements of our customers. These switches are either over-riding tongue rails or under cut tongue rails. Our range of switches is supplied with complete point machine, sleepers (steel). We are engaged in manufacturing and supplying a wide array of Fabricated Railroad Switches. These railroad switches are fabricated as per the international quality standards using superior quality material. These are strictly tested for quality by our experts before delivering them to the clients. Track Derailing Switches are used for separating a particular line from the adjacent running lines so as to prevent infringement. We are an eminent name as Manufacturer, Exporter and Supplier of Track Derailing Switches. These switches are manufactured for 52 kg and 60 kg rails. We can process bulk orders for Track Derailing Switches. We are the leading manufacturer and supplier of Rail Tongue & Switches. These tracks are widely known for corrosion resistance and high performance. These are highly effective in the installation site and assure a safe journey of the trains. These products are available in market at competitive rates. Switches and crossings play an essential role in connecting the rail network. They are used to guide trains from one track to another and to enable lines to cross paths. Put simply, they're the junctions that allow us to create a multi-lined, multi-routed rail network. We are engaged in manufacturing and exporting a wide range of railroad switches.